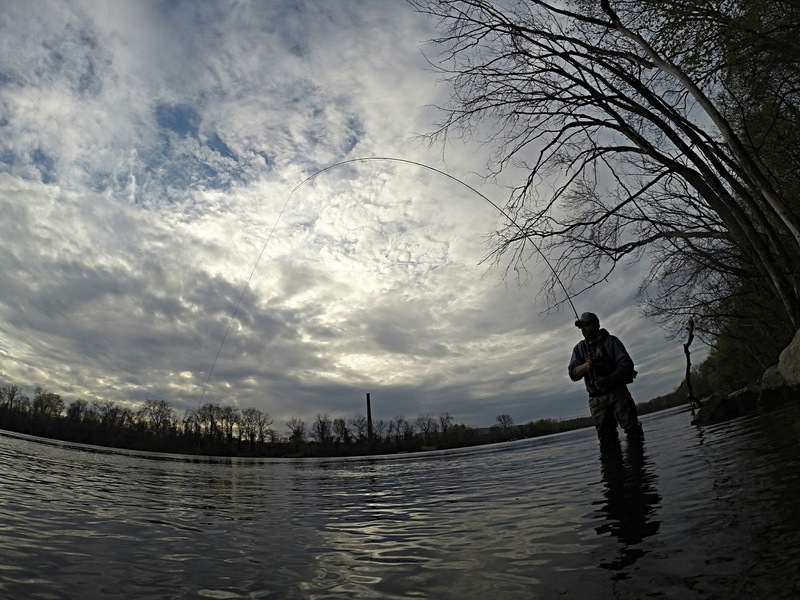 I met up with my friend Mike yesterday to do a little shad fishing. I went out once already, at the first mention of a run starting, but struck out. 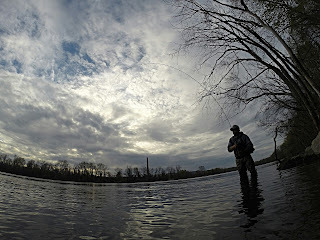 Instead of fishing a favorite tributary, Mike asked me to join him on the Connecticut River. It's big water. I didn't know what to expect, so I brought a lot of gear. I hooked up within the first few minutes, which was actually sort of a curse. I figured I had my rig all dialed in, which was not the case at all. I was the only fly fisherman there. The spin fishermen were nailing shad left and right. I switched rigs and hooked up again, but it was another lucky take. I tried messing around with leader length, fly weight, and different density tips, but none of it worked. I had the proper distance covered, but I wasn't getting the flies down enough and the floating line/Versileader combo seemed to be sweeping my flies over the lies too quickly. It's easy to get frustrated in a situation like that, but I felt determined to figure out this puzzle. I hiked back to the car and picked up a triple density scandi head. The only one I had with me was a F/I/S2. I crossed my fingers, put it in my pack, and hiked back to the river. Then I realized I forgot the reel in the car, so I had to go back. Now I was frustrated! I added a 10' Rio Versileader (7.0 i.p.s. ), 3' of fluorocarbon tippet, and a heavy fly. I crossed my fingers and went back to it. 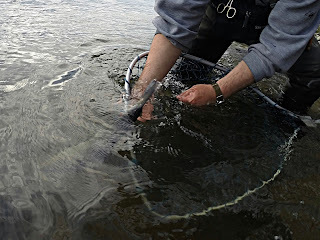 I was hooked up within a few casts. It wasn't just luck this time, either. The new setup was the right move. It slowed my fly down enough to let it sink and to let the shad see it. I had pretty steady action from that point on. I wasn't putting up numbers like the spinning guys, but it was about as good as it could get on a fly rod on this particular day. Eventually, I realized I didn't need a very heavy fly. The line and leader combo took care of it and casting became a lot more pleasant. Experimenting with lines definitely paid off. Sure, it took a couple of hours to get it all figured out, but I was still able to enjoy plenty of action. More importantly, it's another lesson to keep stored away until it's needed again. Way to stick at it and figure things out! And thanks for sharing the knowledge! Good to know!